Howard Carter Lease | Questions? Great! Contact Us NOW! Get Your Car or Truck Lease Approved Today! Drive Away Tomorrow! 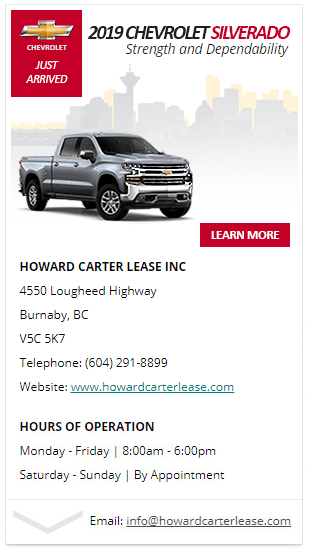 At Howard Carter Lease – we’ve assisted thousands of Canadians obtain vehicle lease’s while exceeding our loyal customer’s expectations. Today, we remain committed to providing an unrivaled vehicle purchasing experience that – removes any pressure and provides our customers with the unparalleled level of service, superior vehicle selection and the affordability they desire!